Mr. Farouk Hosny, Minister of Culture, announces that the expedition of the Supreme Council of Antiquities at the Avenue of the Sphinxes found today twelve new sphinx statues from the reign of Nectanebo I (380-362 BC). These sphinx statues were found in the last sector of the Avenue of the Sphinxes. 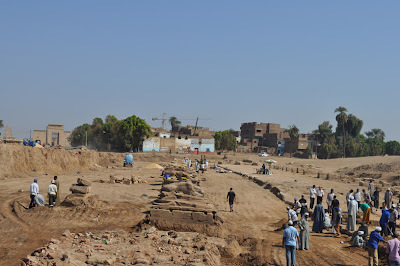 Zahi Hawass, Secretary General of the SCA, said the discovery is not located within the known road of the Avenue of the Sphinxes between Karnak and Luxor Temples, but instead at the end of the newly discovered road of Nectanebo I. 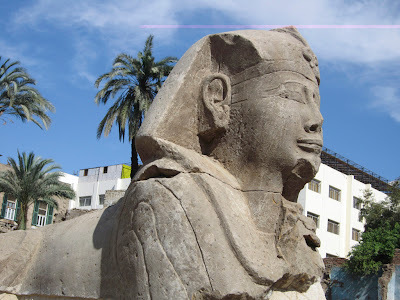 The Avenue runs from Luxor to Karnak, where it connects to the temple of the goddess Mut. Mansour Boraik, Supervisor of Luxor Antiquities, indicated that this is the first time a new road that runs from east to west, toward the Nile, has been found. The most interesting part of this new discovery is that the 20 meters thus excavated is built from sandstone from the quarries at Gebel Silsila, north of Aswan. The total length of this road to the Nile is about 600 meters. Dr. Hawass mentioned, too, that along this way the sacred boat of Amun, king of the gods, traveled on the god’s annual trip to visit his wife, Mut, at Luxor temple, and the king used it as well for religious processions. This discovery marks the first time that archaeology has revealed this route, which is mentioned in many ancient texts. 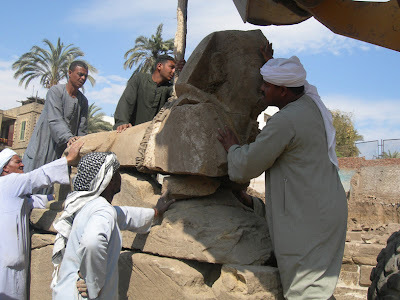 Besides the sphinx statues, which are inscribed with the name of Nectanebo I, the excavation team also recovered Roman period objects, including an oil press and pottery. Excavations remain ongoing.